Factory MSRP: $24,129 2020 Toyota Corolla LE Black Sand Pearl 53/52 City/Highway MPG As part of the Toyota family, your exceptional ownership experience starts with ToyotaCare, a no cost maintenance plan with 24-hour roadside assistance.The ToyotaCare plan covers normal factory scheduled service for two years or 25,000 miles, whichever comes first. 24-hour roadside assistance is also included for two years, regardless of mileage. Factory MSRP: $24,254 2020 Toyota Corolla LE Barcelona Red Metallic 53/52 City/Highway MPG As part of the Toyota family, your exceptional ownership experience starts with ToyotaCare, a no cost maintenance plan with 24-hour roadside assistance.The ToyotaCare plan covers normal factory scheduled service for two years or 25,000 miles, whichever comes first. 24-hour roadside assistance is also included for two years, regardless of mileage. Factory MSRP: $24,254 2020 Toyota Corolla Hybrid LE Gray Door Edge Guards, Fabric 6-Way Adjustable Driver seat, 4-Way Adjustable Front Passenger seat Audio, 8" Touch Screen, 6 Speakers, HandsFree Bluetooth, USB Media Port, 1 USB Charge Port Siri Eyes Free, Apple CarPlay Compatible 60/40 split fold-down rear seat 7-in Color TFT Multi-Info Display Auto Climate Control w/ Push Btn Cntrls Auto Climate Control w/ Push Btn Cntrls, All-Weather Floor Liner Package (DISC), All-Weather Floor Liners. 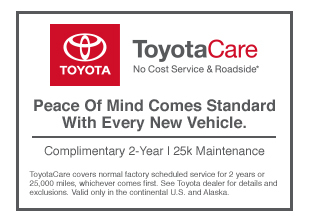 53/52 City/Highway MPG As part of the Toyota family, your exceptional ownership experience starts with ToyotaCare, a no cost maintenance plan with 24-hour roadside assistance.The ToyotaCare plan covers normal factory scheduled service for two years or 25,000 miles, whichever comes first. 24-hour roadside assistance is also included for two years, regardless of mileage.